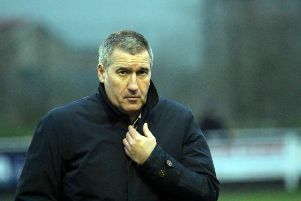 Banbury United boss Mike Ford has laid down the gauntlet to his attacking players. The Puritans have simply not scored enough goals this season and Ford says they need to start delivering. United face three tough Evo-Stik League South fixtures, starting with Saturday’s trip to Needham Market who sit just outside the play-offs. Joint premier division central leaders Stourbridge are in town three days later followed by long-time leaders Kettering Town the following weekend. Ford said: “We’ve got a really tough run of games coming up. Stourbridge have always been a tough team, very consistent, and they’re right up there this season. They’ve always been thereabouts and have stuck with the same manager over the years. As for his side’s lack of goals, Ford said: “We’re now more difficult to beat, looking solid and creating chances but we’re being let down by poor finishing. Our attacking forward players have simply not got enough goals for us. “Those players at the top end of the pitch have got to start scoring because, no matter what they contribute to the team, ultimately they will be judged on how many goals they get. Players can work out for themselves why they are in and out of the side.